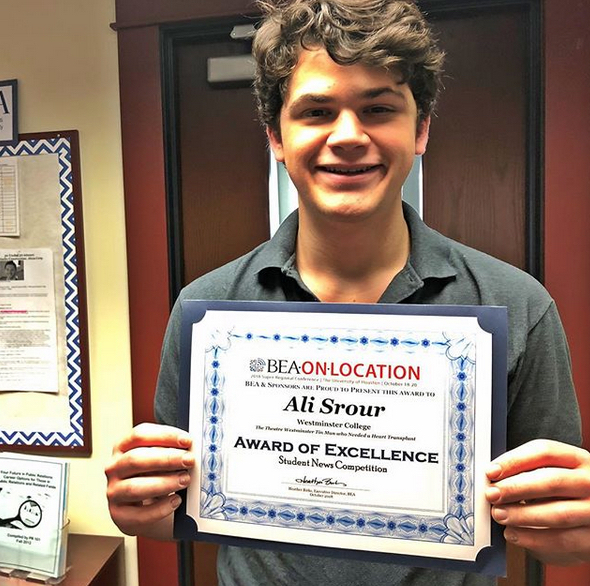 A Westminster College podcast/radio report produced and reported by sophomore Ali Srour received recognition from the Broadcast Education Association (BEA) as part of the BEA On-Location 2018 Super-Regional Conference held at the University of Houston. Srour’s “The Theatre Westminster Tin Man Who Needed a Heart” earned a Student News Award of Excellence in the news competition category. Srour’s piece tells the story of Jamie Alcroft when he was a sophomore at Westminster in 1969. Srour produced and reported the story as a project in his first-year course, Writing for Electronic Media. To listen to the story, visit https://soundcloud.com/user-399821279/jamie-alcroft-the-tin-man-with-a-heart.